TechCrunch reports that YouTube may drop Microsoft Internet Explorer 6 support soon. In my opinion this is excellent news. Just a couple of days ago I spent almost the whole day trying to make the site with complex CSS layout work correctly in the Internet Explorer 6. FireFox, Opera, Safari and newer versions of Internet Explorer were all fine. Internet Explorer 6 required its own CSS. It is plain stupid to support such an old browser that does not behave according to standards in any mode. I do welcome MSIE6 support drop from major market players! It means that users will start to upgrade and we (web developers) can finally get rid of this old and badly working browser. Since YouTube belongs to Google, it can be a first step for Google to drop MSIE6 support. If Google does it, it would be a big help to all web developers around. Last Saturday I finally got my copy of the Adobe Creative Suite 3 Web Premium from eBay. This software is costly, so I looked for a good opportunity to acquire it. My edition includes Photoshop Extended, Illustrator, Acrobat Professional, Flash, Fireworks, Dreamweaver and something else that I never heard of before. I mostly need Photoshop, Illustrator and Flash, the rest is not very relevant to me. First impressions are good. I never was a fan of Adobe products but CS3 is suprisingly good. For example, Photoshop Extended open faster than Photoshop Elements. I am not sure how it can be (Elements is supposed to be lighter). It also consumes less memory, opens files faster. Interesting fact is that Photoshop's user interface did not change since mid–nineties: still many scattered windows, still small ugly fonts. But on the other hand people are used to it, so changing it may cause certain invonvenience. In overal I am very satisfied with the purcase. I got it for a good price and all professional possibilities are now open to me. Adobe Photoshop is a de facto standard for graphical processing. If you work with web site or any other graphical design. Photoshop is usually a must. However not everyone can afford it. Adobe charges a lot for its products. Fortunately with Photoshop there is a much cheaper replacement: Adobe Photoshop Elements. It costs nearly $70 instead of $645 for the full Photoshop. Photoshop Elements is intended mainly for Photographers and amateur designers. It lacks many advanced powerful features of its full brother, such as layer sets, curves, etc. 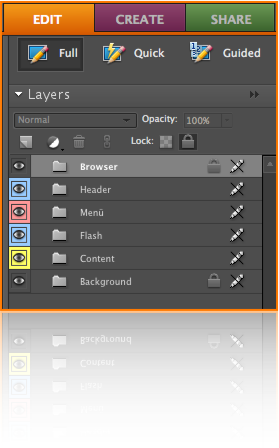 I searched the web for the way to open the group in the Photoshop Elements or to split the layer set into separate layers. I could find the way to do it but I found a better solution. A small interesting fact: one animated image in the Skype chat window (the one with tongue out) raises Skype CPU usage from 5.5 to 11% (double!). In TYPO3 you can add it through the normal page.headerData or page.shortcutIcon TypoScript. Luck ends here. The most popular browser, Microsoft Internet Explorer does not recognize this tag, requires the file to be named favicon.ico, be placed in the root of the web site and supports only Windows proprietary icon file format (.ico). So you can hardly have different icons for the Internet Explorer without tricks.